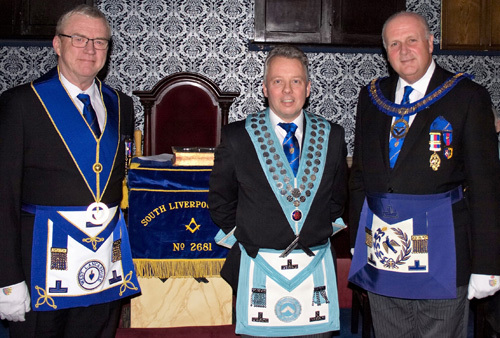 At its recent regular meeting, South Liverpool Lodge No 2681, on behalf of the Garston Group, were delighted to welcome Assistant Provincial Grand Master David Winder and Philip Preston to provide the gathered brethren with an overview and progress update on our Masonic Charitable Foundation 2021 Festival, in their respective capacities of vice president and chairman of the festival. Pictured from left to right, are; Philip Preston, Ian Yoxall and David Winder. The lodge was opened by WM Ian Yoxall, whose sad first duty, was to ask the brethren to stand in respect of departed merit as the lodge had lost two of its members since its last meeting. Ian was then pleased to welcome the visiting brethren to the lodge, which included our own Assistant Provincial Grand Master Derek Parkinson, to whom Ian offered the gavel of the lodge, which Derek was equally pleased to return. David then provided the assembled brethren with a detailed overview and update on the progress of our festival, as well as the reasons behind holding a four, rather than five year event. But his first words were of thanks to all those who, in whatever capacity and to whatever level, had contributed to providing and raising funds, thus helping to make a difference. He continued by explaining the reasons and benefits in combining our four main charities into one, under the banner of the MCF and how savings made, had helped in ensuring those in need received prompt and effective relief. How, last year alone, some £29,000,000 had been donated to Freemasons and their dependants, as well as the wider non-Masonic community. Indeed, the MCF he stated, was third only to the National Lottery and the Red Cross in donations to charity. “Wear your steward’s jewel with pride”, is a term we hear often and it was clear to all that David is very proud of our jewel. He explained that this is the first occasion a Province has been allowed to have its own festival jewel. Adding, that it not only displays our Provincial crest, but also the red rose of Lancashire. David then explained the various levels of patronage available to individuals, lodges and chapters, but he emphasised the fact, that whatever a brother can donate will add to our overall objective. He also encouraged the use of the relief chest scheme and to gift-aid it. As he said, where else can you derive a 25% return on your investment. Following an informative Q&A session, David then returned to his chair, were the WM and the assembled brethren offered him a well deserved round of applause. Pictured from left to right, are: Peter Williams, Howard Griffiths, John Murphy (Garston Group Chairman), Derek Parkinson, Ian Yoxall, David Winder, Sam Robinson, Dave Atkinson (Garston Group Vice Chairman), Philip Preston and Paul Shirley (Regional Charity Steward).